Inspired by the emphasis on human health, the Logan Simpson team developed three conceptual design alternatives: “Mind and Body,” “Human Nature,” and “Nature/Nurture.” These alternatives drew inspiration from life cycles, the systems of the human body, and the effect of nature on human health. These three concepts led to the final conceptual master plan, “Mind, Body, and Spirit,” which contained elements from each alternative. To facilitate implementation, the master planning team divided the park into seven “precincts,” each with its own character and programming focus, including helping patients of local medical facilities with rehabilitation, improving the overall fitness of park users, offering places for contemplation and remembrance, emphasizing healthy eating, gathering together, and just plain having fun in the outdoors. The precinct system also allows flexibility in developing the park over time. In developing the master plan, Logan Simpson and the City of Goodyear worked closely with a (special) board made up of representatives from local hospitals, medical providers, health-oriented businesses, the Arizona Health Department, and the city. 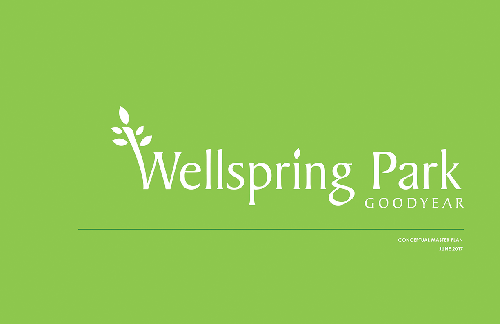 Recently, the board formed The Wellspring Park Conservancy, a 501(c)(3) nonprofit organization expected to continue to help guide and seek funding for park development. In addition to developing the master plan, the Logan Simpson Team developed a logo for the park and created a fly-through video that helps visualize how the park may look when finally developed. The Wellspring Park Master Plan represents the City of Goodyear’s vision to create an urban center that puts community health and wellness in the forefront of making a community that is vital, comprehensive, and remarkable. Check out the fly-through here!